From the author of Dear Evan Hansen, The Reminders is perfect for fans of J. Courtney Sullivan's The Engagement or Graeme Simsion's The Rosie Project, and follows what happens when a girl who can't forget befriends a man who's desperate to remember. Grief-stricken over his partner Sydney's death, Gavin sets fire to every reminder in the couple's home before fleeing Los Angeles for New Jersey, where he hopes to find peace with the family of an old friend. Instead, he finds Joan. Joan, the family's ten-year-old daughter, was born Highly Superior Autobiographical Memory, or HSAM: the rare ability to recall every day of her life in cinematic detail. Joan has never met Gavin until now, but she did know his partner, and waiting inside her uncanny mind are startlingly vivid memories to prove it. Gavin strikes a deal with Joan: in return for sharing her memories of Sydney, Gavin will help her win a songwriting contest she's convinced will make her unforgettable. The unlikely duo set off on their quest until Joan reveals unexpected details about Sydney's final months, forcing Gavin to question not only the purity of his past with Sydney but the course of his own immediate future. 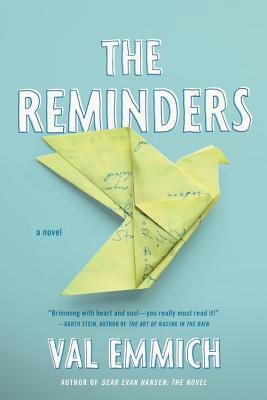 Told in the alternating voices of these two irresistible characters, The Reminders is a hilarious and tender exploration of loss, memory, friendship, and renewal. Val Emmich is a writer, a singer-songwriter and an actor who was called a "Renaissance Man" by the New York Post. He has had roles in many TV shows, including 30 Rock, Vinyl and Ugly Betty, and is the author of Dear Evan Hansen: The Novel, a book based on the hit Broadway show. He lives in Jersey City, New Jersey. "In a story that is both startlingly original and deeply familiar, [Val Emmich] has given literature a remarkable young heroine, Joan, and a series of seemingly small events that add up to the kind of story small classics are made of. I could not stop reading, and was bereft when the story ended." has written a quirky, touching, and addictive read."